Alfaisal University was founded by the highly reputed King Faisal Foundation as one of the first private non-profit, research and teaching universities in Saudi Arabia committed to achieving international standards of excellence. It has the support of national and international co-founders and distinguished Board Members that have continually supported the university in its mission to be a student –centred institution committed to research. As an example of this drive for excellence, it is our pleasure to announce that the first US Patent has been awarded on 15 October 2013 to one of Alfaisal’s faculty members, Dr Edreese Alsharaeh and his research team. The patent entitled, Composition and Method of Making Nanocomposite Containing Graphene Sheets, describes a dual approach with slight modification to produce a nanocomposite using graphene sheets. The nanocomposite may be used for medical devices such as bone cement, dentures, paper, paint and automotive industries. A novel microwave irradiation was used to obtain the sheets. The three inventors, Dr Edreese Alsharaeh, Dr Mohammad A. AlDosari, Mr Ali Othman are to be congratulated on this achievement. 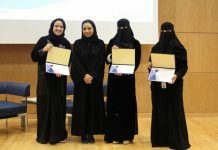 The patent which is assigned to Alfaisal University in Riyadh (SA) was granted less than six months after filing due in part to its novelty. We are also pleased to note that Mohammad A. AlDosari is from KACST. Alfaisal University has close collaborative research ties with KACST. 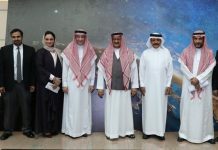 The Acting Dean of the College of Science & General Studies at Alfaisal University, Dr Nouredine Zettili, said, “We are immensely proud of Dr Edreese not only for his research achievements, which include a patent, but also for his dedication to his students as shown by his high student evaluations, and his selflessness in the area of service to Alfaisal. This is the type of faculty member that helps to build a strong research oriented institution as envisaged by the King Faisal Foundation”.